This past weekend, November 6-8th, I got the chance to experience an organized team tour with DB Sports Tours as I accompanied my brother’s soccer team to Manchester. Even though I was attending the tour to join my family and observe, it felt as if I was another one of the kids getting to enjoy all of the exciting features that were offered. The trip consisted of an Old Trafford stadium tour, a Premier league game, matches versus UK opposition and a training session with Manchester City academy coaches. As a first time visitor to Manchester I did not know what to expect. The first step of the journey was boarding the coach on Friday morning. Occupied with forty-one shouting kids who were filled with adrenaline and excitement, the bus was so lively that I could hardly tell it was only six o’clock in the morning. Frankly, I understood exactly how they felt. Our first day in Manchester we visited the home of the Biggest Club in the UK Manchester United Football Club’s Old Trafford Stadium. We were given a tour of the stadium that included stops in the Manchester United locker room, the pressroom and even down next to the field to sit in the coach’s chairs. One thing I will always remember is the initial feeling of walking into the stands and looking out at the pitch amazed with how big the stadium was. The Locker room was astounding, I tried to imagine the rich tradition of Manchester United on game days as I was standing in the room. The kids got to pretend like they were Man United players sitting at their stalls getting ready to take the pitch for the couple minutes that we were in locker room. How many people could say that they were in the same place where all of the professional Man United players prepare for their big games? We then made our way to the pressroom where we took pictures in front of the sponsor signs and got to experience what sitting on the podium discussing results feels like as a Man United player or coach. When we got down to the coach’s chairs I got caught up looking out around the empty stadium, imagining myself standing here in a full stadium with thousands of crazy fans and I was taken back. After the tour was over, the DB Sports Reps brought us around to meet manager Louis Van Gaal and superstar midfielder Juan Mata. They were both very welcoming taking pictures with the young players and signing autographs for all of them. It was a wonderful and unexpected surprise that was not originally a part of the tour. This moment was eye opening to me how big soccer is here, the young lads were reacting the same way some kids in America would if they met Derek Jeter or Tom Brady. Overall this tour gave me a taste of not only the general stadium, but I got to experience how the professionals get to perceive it. When this day ended it left me excited for the next day to start. Another part of the tour experience was attending a match. We got to see Stoke City Football Club play Chelsea Football Club the reigning Premier League champions in a Premier League game. Our seats were right in the front row along the sideline beside the tunnel the players use to enter the pitch. To open the match the young players on the tour got to go out onto on the pitch to hold the red and white checkered stoke flags during the guard of honor where they were only two feet from all of the professionals. It was interesting and thrilling to be involved in something at the highest level of soccer, almost as if the kids were given a job for the game. Seeing their faces as they stand on the field waving the flags as some of their favorite superstars run past them was dreamlike. The atmosphere in the stadium for a premier league game is overwhelming and nothing I have ever experienced before and I recommend everyone to take an opportunity to experience it. Having almost 30 thousand people all rooting and yelling for the same team singing chants is nothing like attending a sporting event in the states, there is much more passion showed for the home and even away team. Marko Arnautović scored in the 53rd minute to put the home team Stoke ahead and the stadium erupted I couldn’t hear myself think! After Stoke held on to beat the defending Premier League champions Chelsea, we were the only team allowed to stay back in the stadium and several players came out to our seats to sign autographs and take pictures with the young players. 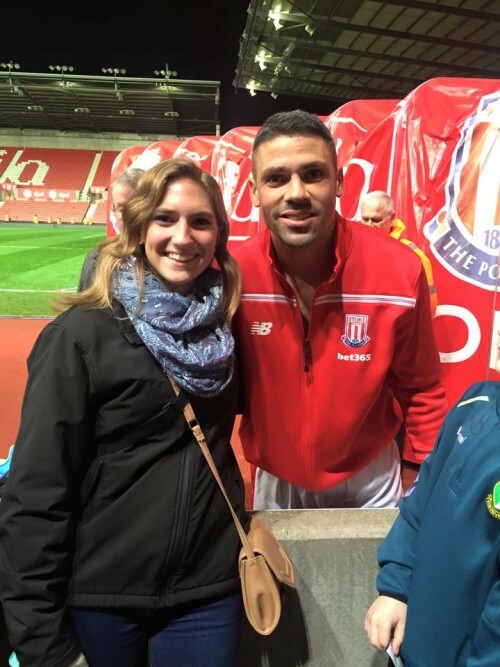 I was fortunate enough to meet Striker Jon Walters. Suddenly this famous player that thousands of fans were just screaming for was next to me posing for a photo. The kids were going crazy for him because he is an Irish player in the premier league and one of the five that happen to be on the Stoke first team. The training sessions that the players got put through were exceptional. Professional coaches from Manchester City worked with the young athletes preforming drills and going over skills. Being able to learn and train with Manchester City’s academy coaches will help the kids improve their game, which is an invaluable experience. In its entirety this trip is something that I will never forget. DB Sports Tours certainly made my dream become a reality.